In this week's Trust Me episode viewers will see Bath researcher Dr Oly Perkin put participants through their paces with a new ‘exercise snacking’ regime. Zoe and Oly filming a section of this week's 'Trust Me I'm a Doctor' in our Sports Training Village. The University is the venue for part of this week’s BBC 2 Trust Me I’m a Doctor episode, focusing on how ‘exercise snacking’ – free and easy home-based exercises - could help people build or maintain muscle mass, positively impacting health, prolonging independence, and potentially helping the NHS save money on care of older adults. Watch the episode - broadcast on Wednesday 12 September. 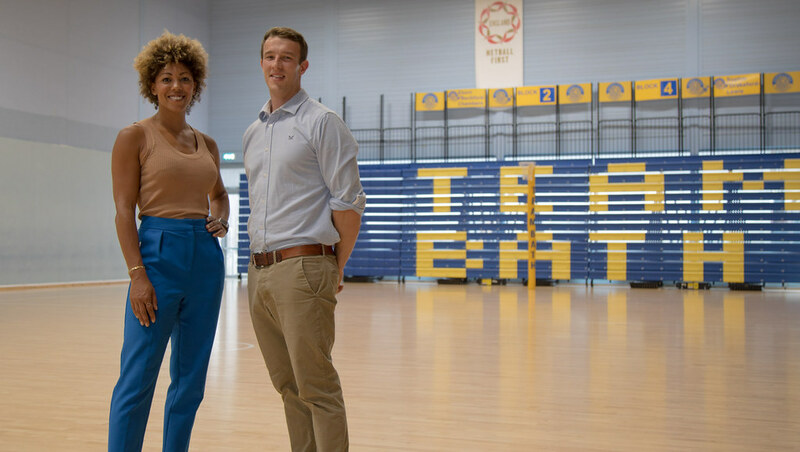 Filmed in our Sports Training Village and Quads accommodation, viewers will see Trust Me presenter and GP Dr Zoe Williams learn more about the work of Department for Health researcher, Dr Oly Perkin. As part of Oly’s PhD, under the supervision of Dr Polly McGuigan and Professor Keith Stokes, he analysed the effectiveness of exercise snacking through a pilot study among over 65s. In this week’s episode viewers learn more about this and also follow-on work which is currently being undertaken based on those initial findings. This research suggests that just a few minutes every day of exercise in the home can lead to marked improvements in muscle mass and strength in older adults. This is set against a backdrop where over 50s start to lose around 1% of their muscle mass every year. This loss accelerates once we hit 60 and can be dramatically increased if people find themselves inactive for periods of time, including through stays in hospital. Without sufficient muscle strength we struggle to move around and accomplish day to day tasks – which is why strength often dictates how long someone in later life can continue to live independently. Trust Me’s Dr Zoe Williams explains: “The problem of muscle loss in later life is something that I come across a lot in my older patients, particularly when they’ve emerged from an illness or stay in hospital, and I’ve seen first-hand how it can affect their ability to carry out day-to-day tasks and live independently. That’s why I was so excited to find out about the research conducted by Oly Perkin and his colleagues at the University of Bath. “What really impressed me about this study was the scale and speed of the progress made by the participants – in just 4 weeks they were able to rebuild the same amount of muscle that people at that age naturally lose in the course of 1 - 2 years – that’s a massive improvement. “What’s more, standing up out of a chair is something that anyone can do anytime, anywhere for free – all you need is a chair! I’ll certainly be telling my older patients about this research and will be prescribing them sit-to-stand exercises as the single best thing they can do to prolong their strength and independence." As part of Oly’s study, he asked 10 older adults (aged 65 – 80) to complete 5 minutes of home-based exercise snacking twice a day for 28 days, and another 10 older adults to continue their normal daily activity and act as controls. The exercises were sit-to-stand from a chair, march on the spot, seated knee extension, standing knee bends, and calf raises. The participants did each exercise for one minute, completing as many repetitions as they could, and then rested for one minute before doing the next exercise. After four weeks of exercise snacking, the number of sit-to-stand repetitions that the snacking group could complete in 60 seconds increased by 30%, and leg strength and power increased by 5% and 6% respectively. Alongside this, thigh muscle size increased by 2%, with no changes in the control group. The follow-up study is using electromyography (EMG) to measure the level of muscle activation required to carry out the exercise snacking, and compare that to the muscle activation that would be seen in older adults when they perform gym based exercises as per the American College of Sports Medicine guidelines for improving strength.